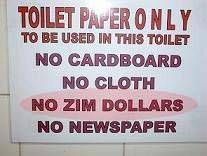 The Zimbabwean dollar has gone, but this picture depicts its inglorious end. UPDATE: Thomas Kang is a trillionaire! Esse seu posto recebeu um link no maringalrevlution.com.